Colony declines are a major threat to the world’s honey bees, as well as the many wild plants and crops the bees pollinate. Among the lineup of possible culprits–including parasites, disease, climate stress and malnutrition–many have pointed the finger squarely at insecticides as a prime suspect. However, a new study from the University of Maryland shows that the world’s most common insecticide does not significantly harm honey bee colonies at real-world dosage levels. The study, which was published March 18, 2015 in the journal PLOS ONE, looked at the effects of the insecticide imidacloprid on honey bee colonies over a three-year period. To see significant negative effects, including a sharp decrease in winter survival rates, the researchers had to expose the colonies to at least four times as much insecticide encountered under normal circumstances. At 20 times the normal exposure levels, the colonies experienced more severe consequences. The study does not totally absolve imidacloprid of a causative role in honey bee colony declines. Rather, the results indicate that insecticides are but one of many factors causing trouble for the world’s honey bee populations. Imidacloprid is one of a broad class of insecticides called neonicotinoids, so named because they are chemically derived from nicotine. In tobacco and other related plants, nicotine acts as a deterrent by poisoning would-be herbivores. While nicotine itself was once used as an insecticide, it has fallen out of favor because it is highly toxic to humans and breaks down rapidly in sunlight. Neonicotinoids have been engineered specifically to address these shortcomings. “Imidacloprid is the most widely used insecticide in the world. It’s not restricted because it is very safe–an order of magnitude safer than organophosphates,” Dively said, drawing a comparison with a class of chemicals known to be highly toxic to nearly all living things. Dively, Hawthorne and their colleagues found some evidence for at least one synergistic combination. 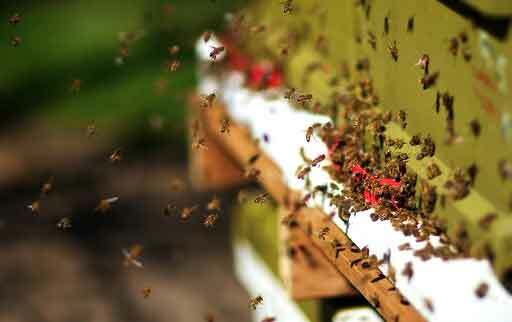 At the highest dosage levels (20 times the realistic dosage) colonies became more susceptible to Varroa mites, parasites that target honey bee colonies. A mite infestation can cause a whole variety of problems, including viral infections and an increased need for other pesticides to control the mites.